C/ Gavina, 9, 07015 Cala Mayor, Spanje. 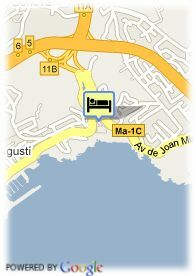 Situated on the beautiful beach of Cala Major, next to the Marivent Palace. The Santa Ana Hotel has 195 spacious bedrooms, which have private terrace, sea view, TV. Sat. telephone and bathroom. The Hotel public rooms are spacious and furnished in a traditional, antique style.